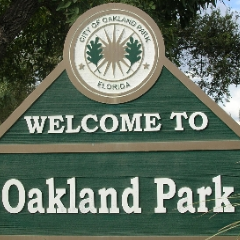 The City of Oakland Park is one of the older municipalities in Broward County. It was originally chartered as the Town of Floranada in 1925. The boundaries went from the ocean west to what is now U.S. 441, and from the north fork of Middle River north to Cypress Creek. The few who were left tightened their belts and decided to make some major changes. A referendum abolished the Town of Floranada and established the City of Oakland Park. The boundaries were reestablished to approximately the west side of U.S. 1 west to NE 3rd Avenue and the north fork of Middle River north to what is now Prospect Road. Gradually the City of Oakland Park began to grow. A few new homes appeared and the population increased. As the years passed, the size of the town also began to expand, both in residents and in area. Although it will never cover as much territory as Floranada, today it is a little over 8 square miles, and approximately 43,000 residents call Oakland Park home. It has a notable recreation program, its own excellent library, expansive parks, and much more.